In addition, with Bluetooth Smart and attractive free apps, you are prepared for the future. 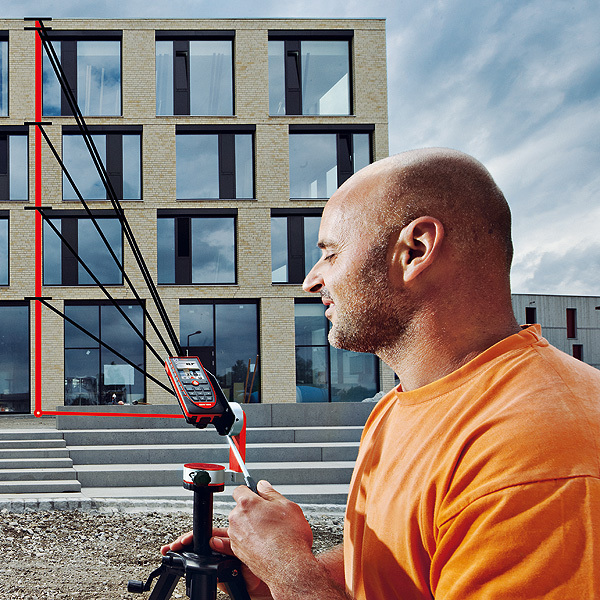 With the Pointfinder, the Leica DISTO™ D510 takes measurements with perfect accuracy and in unfavourable light conditions. This is a decisive advantage when working outside in sunny weather. Even if the red laser point is no longer visible to the naked eye, the target can be seen exactly in the crosshairs on the display. 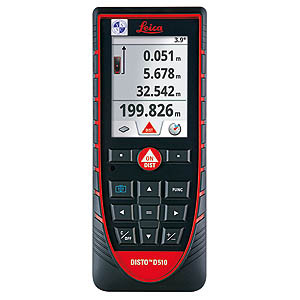 The Leica DISTO™ D510 is equipped with a 360° tilt sensor. This means that it is not only possible to measure angles, but horizontal distances too! 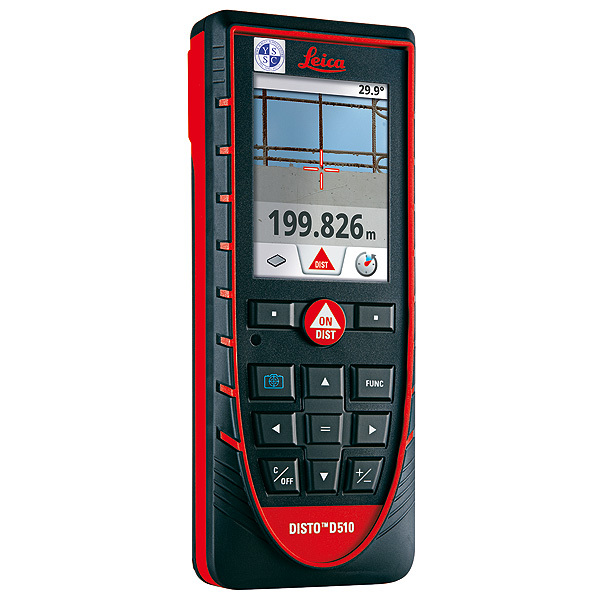 Combined with the Pointfinder, amazing indirect measurement options are provided. Hence, measurements are possible where no reflective target point is available, e.g. when determining the height of a tree or when measuring the height of a reflecting glass facade. These could not be measured with a conventional laser distance meter. 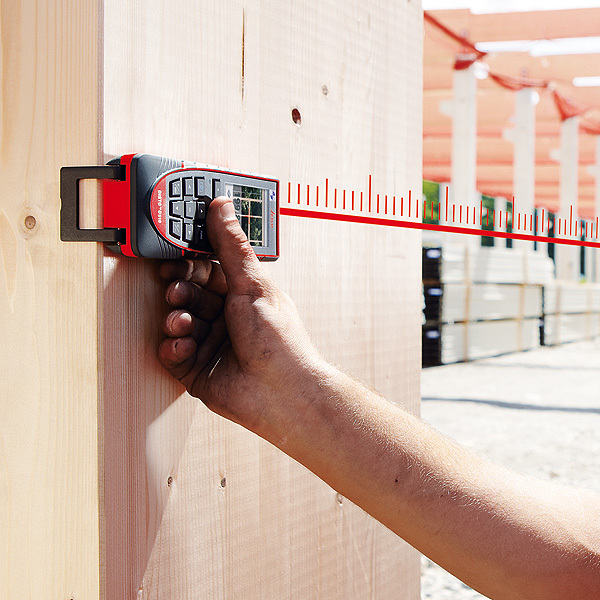 The Leica DISTO™ D510 is capable of more than just measuring. Measurement data can be conveniently and accurately transferred using the integrated Bluetooth® Smart Technology. 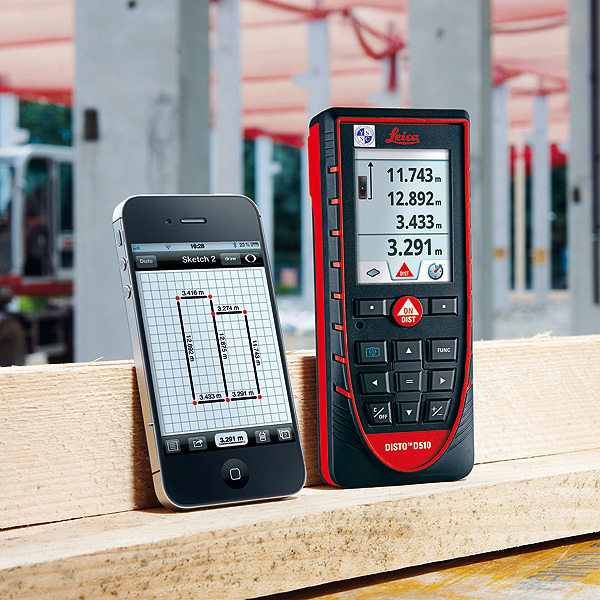 The free app, "Leica DISTO™ sketch", supports the creation of ground plans or tables on iPhone or iPad. Dimensions can even be entered onto photographs with no effort whatsoever! 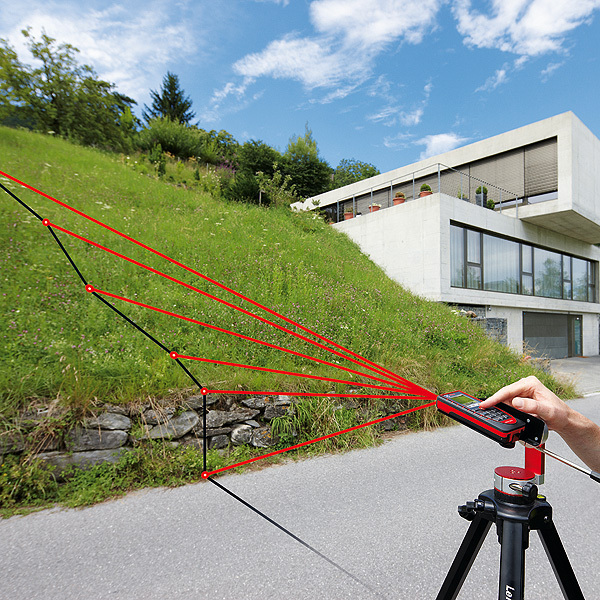 Providing the simplest possible operation of complex measuring functions is a must for Leica Geosystems. 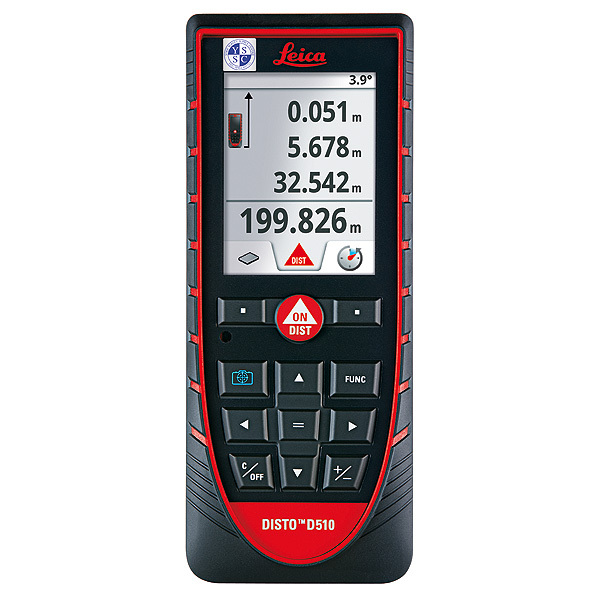 The Leica DISTO™ D510 has been adapted to the user interface of modern cell phones. Furthermore your favourite functions can be assigned to a pair of selection keys - for quick access with a single button press - and the integrated, easy-to-understand help function does not leave you in the lurch on site. Functions: Minimum / maximum measurements, Area/volume measurement, Triangle/room angle function, Painter function, Trapezium measurements, Pythagoras functions (2 points and 3 points), Inclination tracking, Smart Horizontal Mode, Sloped object measurement, Height tracking, Height profile measurements, Stake-out function (a/b) and Subtraction/addition. 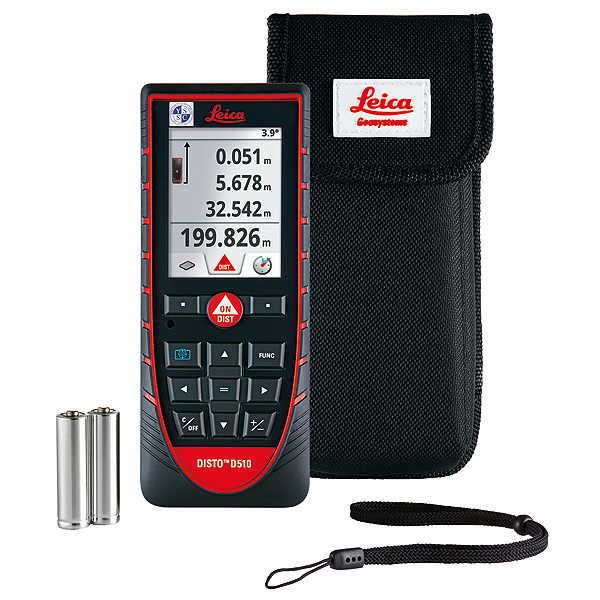 Free App: "Leica DISTO™ sketch"
In the box: Leica DISTO™ D510 laser distance meter, Holster, Hand loop and Batteries.